Learning how to broadcast your screen with microphone audio via Wirecast may be actually more complex than expected. Follow these steps to learn how, and let us know if you need further support. First, you will need both Wirecast and an added install called “Desktop Presenter“. Once you have both installed, launch Wirecast and configure for your stream. 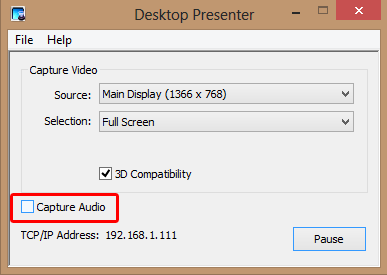 Second, to be able to use the mic you need to de-select “Capture Audio” from the Desktop Presenter window that pops up. Fourth, click the camera icon within the main window a second time. From here, select your internal microphone (note, the name for this will be different depending on setup). Fifth, now select the UScreenCapture image from the items below. Sixth, highlight the UScreenCapture image, click the audio icon on the far right, and finally select internal microphone (note, the name for this will be different depending on setup). You are now ready to rock and roll with your audio and screen-sharing!